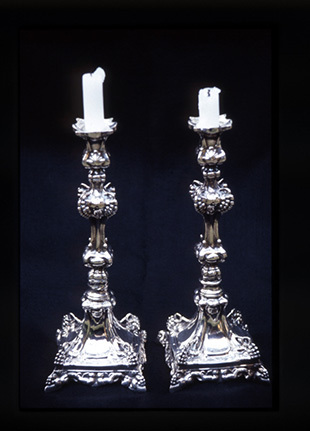 In 1902, 20-year-old Freidel Surasky carried this pair of candlesticks, given to her by her mother, on her journey from Knyszyn, Poland, to America. Surasky boarded a ship in Bremerhaven, Germany, and disembarked at Ellis Island, New York. From there she traveled by rail to Aiken, South Carolina, where her husband Chaim, his sister and three of four brothers had previously settled. Twenty-five years later, Freidel passed the candlesticks on to her daughter, Esther Surasky Persky, who in turn bequeathed them to her spiritual daughter (and close cousin), Sophie Payeff Sindler. Integral to Jewish custom and ceremony, candles symbolize joy, spirituality, life, and its passing. They are used to welcome the Sabbath, and to commemorate holy days and times of transition.